Frameworks and standards are established to help improve specific domains. One needs to understand the context and specific aspects of the domain, in order to appreciate and usefully adopt frameworks and standards, and derive value out of them. How the service manages the lifecycle of each of the service delivered by them is the domain of service management. In other words, every service provider is doing Service management. When the business outcome facilitated is through use of Information technology, the related services are called IT Services and the management of those services, IT Service management or ITSM. To establish an IT Service management system and continually improve it – organizations can adopt frameworks such as ITIL or Standards such as ISO/IEC 20000. Trying to understand Service management domain through the lens of IT Service management. The biggest drawback of this approach is: One is trying to analyze a larger area through a smaller eye piece with restricted view. 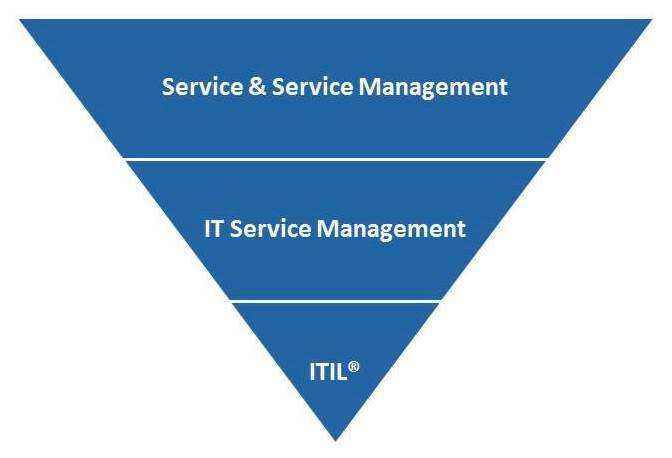 In fact, as the pyramid above shows, one who is in the ITSM domain has a larger portion of practices, best practices and knowledge available in the Service management domain; than a much smaller scope of ITIL®. This in no way of taking away the value of ITIL® as a framework for ITSM: ITIL® provides specific set of practices, presumably crystallized from the global practices of ITSM (and may be even adopted from generic service management). This specificity makes it easier to adopt into an organization’s IT Service Management. When one looks at ITIL® as a best practice Body of Knowledge (BOK) with a generic grasp of Service management and IT Service management domain and context, the adoption becomes more rational, useful and beneficial to the organization. As mentioned above: Service management, ITSM and ITIL are taken as examples here, to demonstrate a larger problem in adoption of frameworks and standards in the industry, more specifically visible IT Industry.